Julen Lopetegui could be sacked by Real Madrid if results do not improve soon, according to Michael Essien. 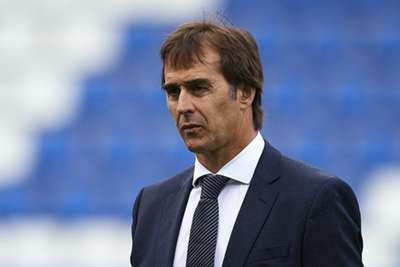 Lopetegui has overseen Madrid's worst goalscoring run since 1985, with Los Blancos failing to find the net in their last four games in all competitions. Defeats to Sevilla and Deportivo Alaves in LaLiga and a reverse at CSKA Moscow in the Champions League have increased the pressure on the coach, who took charge in sensational circumstances after he was fired by Spain just before the World Cup. Madrid captain Sergio Ramos has said it would be "crazy" to dismiss Lopetegui, while fellow defender Nacho Fernandez indicated the team are with the former Porto boss "to the death". Lopetegui has denied fearing the sack but Essien, who played for Madrid in a loan spell during the 2012-13 season, suggested he could be dispensed with if their form does not improve quickly. "Real Madrid are one the biggest clubs, so you can imagine the pressure," Essien said to Omnisport. "We all hope he will do well. "It's a big club and if you're not going to get the results you know what happens next." Essien is best remembered for a nine-year spell at Chelsea, who broke the world transfer record for a goalkeeper to sign Kepa Arrizabalaga from Athletic Bilbao for €80million (£72m) in August. The former Ghana midfielder is impressed with how the Spain international is settling in at Stamford Bridge. "So far, so good," Essien said. "Hopefully he will continue like this."